Arguably the supergroup to beat them all, Cream were formed during that incredible summer of 1966 amidst a period of huge artistic upheaval in British rock, with psychedelia beginning to infiltrate the mainstream. 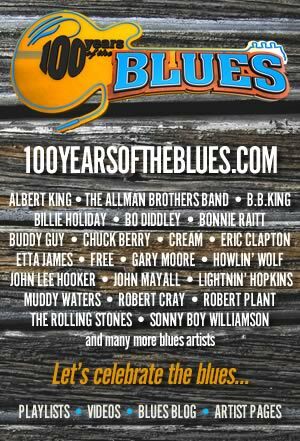 Eric Clapton, Jack Bruce and the estimable Ginger Baker pooled their talents, bringing skills perfected in the Yardbirds, John Mayall & The Bluesbreakers and the Graham Bond Organisation. It’s impossible to overstate the goodwill and praise heaped upon them by press and public alike and from the outset their studio music and live performances became a byword for excellence, enabling them to rival the Jimi Hendrix Experience, The Who and The Rolling Stones as one of the most fruitful periods in British rock history started to make England swing. Their albums and singles successes include – well everything. Consider that their third disc, Wheels of Fire, was Britain’s first Platinum selling double album. So they had impeccable progressive integrity. Yet they also knocked out wah-wah driven hits - ‘Sunshine of Your Love’, ‘I Feel Free', ‘White Room’ and the sublime ‘Badge’, that featured George Harrison and kick-started another new chapter in the music business. They were also fashion icons, post-mod dandies of the underground. They were all over the scene. Cream’s musical dexterity – Clapton’s epic guitar playing, Bruce’s jazz sculpted bass and impeccable vocals, and Baker’s virtuosity around his drum kit foreshadow the arrival of Led Zeppelin, The Jeff Beck Group and the whole second British Invasion of the late 1960s in America. Cream pioneered that. Considering they were only really together for just over two years they were incredibly prolific and became such a legend that their reunion dates in 2005 were as eagerly anticipated as those of Led Zep. Rock and Roll Hall of Famers, individually and collectively, creators of seven Top 40 UK hits, holders of six consecutive Gold selling albums – Cream’s achievements are many and their legacy is to be a lasting influence on power trios, the beginnings of heavy metal and classic British blues rock – modern music full stop. Eric Clapton’s presence as the pre-eminent British guitar player of his day meant that when he quit the Yardbirds there were already signs of the graffiti ‘Clapton is God’ adorning London walls. His friendship with Jack Bruce and Ginger Baker stemmed back to nights sitting in with the Graham Bond Organisation and at Baker’s instigation the trio was formed and readily named as a semi-jocular reference to their ‘cream of the crop’ reputations. In reality Cream also endured a long period of internal friction. Baker’s view that Cream might become a jazz-rock hybrid wasn’t really shared by the others who preferred to wander into psych or white blues and soul. That tension only made them sound better. After playing a club date and headlining the Windsor Jazz and Blues Festival, Cream were joined for an on-stage jam by Jimi Hendrix and suitably energised by his endorsement, the band began to get down to serious song writing. 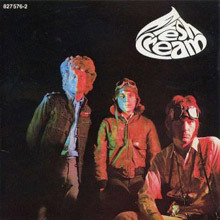 The debut Fresh Cream was recorded in London in the late summer of ’66 during a period of intense national euphoria following the England team’s victory at the World Cup Final and released at Christmas. Musically, Fresh Cream is a pointer to things to come. It combines elastic pop tunes like ‘N.S.U.’ with exploratory blues affairs: you can hear the participants sizing each other up on ‘Spoonful’ and ‘Toad’.That sense of boundaries being pushed is significant, since most other records of the time were based around some kind of democratic structure. Cream sounded like they were about to break out and go nuts. This they did on Disraeli Gears (1967), a fully-fledged psychedelic and hard rock masterpiece knocked out in short order in New York’s Atlantic Studio during May ’67. Pulsating tracks ‘Sunshine of Your Love’ and ‘Strange Brew’ were epic enough when heard on the radio, but takes of ‘Tales of Brave Ulysses’, Baker’s ‘Blue Condition’ and ‘Outside Woman Blues’ continued to break down barriers. Bruce had brought the lyricist Peter Brown into the fold so while they continued to mine traditional material and give it a fresh Cream slant they also had a poetic slant to contemplate now. ‘Strange Brew’ was actually a co-write between Eric and the American husband and wife team of Felix Pappalardi and Gail Collins (they also penned ‘World of Pain’). While the trio combined to grand effect on the harmonised ‘Mother’s Lament’. A calm before the storm? Disraeli Gears would go Platinum, as would their third album Wheels of Fire. This double is half-studio (London, August ‘67) and half-live from the West Coast (March ’68), where the San Francisco elite (the Dead and Airplane included) feted Cream. Pappalardi was now brought in to produce and he extracted marvellous performances. The first part of the pact includes such revered neo-metal items as ‘White Room’ and ‘Politician’ (Bruce and Brown in tandem) while the second album allows listeners to hear Cream in their expanded pomp, jamming around ‘Crossroads’, ‘Spoonful’, ‘Traintime’ and ‘Toad’. Each band member gets ample room to shine and this is generally considered to be one of the most inspired and vital recordings of this or any other epoch. It is totally recommended. Wouldn’t you know it; just as their star burns brightest, Cream decided to disband. But that was the spirit of the era. Musicians were restless and keen to explore new ground. Even so they left behind a generous farewell gift, the album Goodbye (1969). Having given their notice of a slightly protracted farewell tour, Cream played at the Royal Albert Hall and the Forum in Los Angeles, amongst other venues. Three of the songs on the disc are taken from a show at the Forum, making a seamless transition from the previous set. The luscious ‘Badge’ which features some of Clapton’s most thrilling guitar work also has a rhythm guitar and vocal cameo from George Harrison, and the poignantly titled ‘What a Bringdown’ bring this chapter to a close. Goodbye is a very esoteric set indeed. But that’s by no means the end for us. Live Cream Volume 1 and Live Cream Volume 2 compile their Fillmore West, Winterland and Oakland Coliseum shows from the American 1968 tour, but with some subtle differences that make them both hugely worthwhile. The first disc features ‘Hey Lawdy Mama’ done after the style of Buddy Guy and Junior Wells, and a precursor to ‘Strange Brew’, while the re-mastered editions allow one to explore ‘Deserted Cities of the Heart’ and the strung out version of James Bracken’s ‘Steppin’ Out’. Just as invaluable is the superb BBC Cream Sessions (recorded between 1966-1968) since this captures them in a neutral environment, often showcasing their material for the first time to fans. The first five tracks are taken from a November ’66 performance at the Playhouse on Lower Regent Street, and were aired on radio even before the debut album Fresh Cream became available. There are also pieces from Top Gear, the rare Guitar Club take on ‘Crossroads’ (done for the Home Service) and three live in the studio recordings made for the World Service. A most unusual and desirable artifact – this 26-track disc is a valuable historical document. The Very Best of Cream and Those Were The Days are a classic compilation and a classic compilation plus. The second collection is a 4-CD marvel stuffed full of rarities, demos, unreleased material and single B-sides. We’re digging on the long form ‘Toad’, freaking out to the version of ‘Sunshine of Your Love’ they cut for the Glen Campbell Show in 1968, the demo on ‘Weird of Hermiston’ and the flipside track ‘Anyone for Tennis’. There’s so much to discover here. As a supplementary, we also have The Cream of Clapton, a more than nifty run through Eric’s work as a solo artist, founder of Derek and the Dominos and axe man incarnate with the Cream boys. And there you have it. The first supergroup: the best supergroup? Clapton, Bruce and Baker? Hard to find a better one, we’d have thought. Disraeli Gears is the second album by the English rock band Cream. It was released in November 1967 and went on to reach number 5 on the UK Albums Chart. It was also their American breakthrough, becoming a massive seller there in 1968, reaching number 4 on the American charts. The album was #1 for two weeks on the Australian album chart and was listed as the #1 album of 1968 by Cash Box in the year-end album chart in the U.S. The album features the two singles "Strange Brew" and "Sunshine of Your Love". Fresh Cream is the debut studio album by the English rock band Cream. It was the first LP release of producer Robert Stigwood's new "Independent" Reaction Records label, released in the United Kingdom as both a mono and stereo version on 9 December 1966, the same time as the single release of "I Feel Free". The album was released a month later, in January 1967, in the United States by Atco Records in both mono and stereo versions. For many years, only the UK and US stereo mixes were available in CD. The UK mono album was reissued on CD for the first time in late 2013, as part of a deluxe SHM-CD and SHM-SACD sets (both editions also contains the UK stereo counterpart) sold only in Japan. The album peaked at No..6 on the UK album chart and No. 39 on the US album chart. In 2003, the album was ranked number 101 on Rolling Stone magazine's list of the 500 greatest albums of all time. 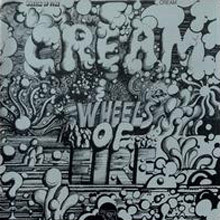 Wheels of Fire is a 1968 double album by the British rock band Cream, consisting of a studio and a live record. It reached #3 in the United Kingdom and #1 in the United States, becoming the first platinum-selling double album. In 2003 it was ranked number 203 on Rolling Stone magazine's list of the 500 greatest albums of all time. It was also released as two single long-players, Wheels of Fire (In the Studio) and Wheels of Fire (Live at the Fillmore), released together with similar cover art. In the UK the studio album art was black print on aluminium foil while the live album art was a negative image of the studio cover. In Japan the studio album art was black on gold foil while the live album art was black on aluminium foil. In Australia both covers were laminated copies of the Japanese releases (the double album was never released in Australia). 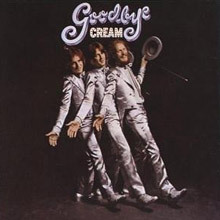 Goodbye (also called Goodbye Cream) is the fourth and final original studio album by the English rock band Cream. The album was released in Europe by Polydor Records and by Atco Records in the United States, debuting in Billboard on 15 February 1969. A single, "Badge", was subsequently released from the album a month later (see 1969 in music). 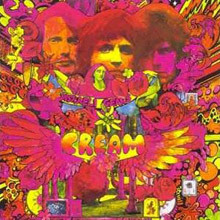 The album was released after Cream disbanded in November 1968. BC Sessions is a live album by the English rock band Cream, released on 25 May 2003 on Polydor Records. It contains 22 tracks and 4 interviews recorded live at the BBC studios in London. 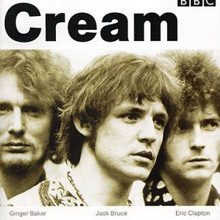 Between 21 October 1966 and 9 January 1968, Cream recorded eight sessions for the BBC radio network, selected highlights from seven of which are featured in chronological order on this collection. Only the versions of "Steppin' Out" and "Lawdy Mama" had been previously released, although both were released on Eric Clapton's solo Crossroads box set, not by the band itself. 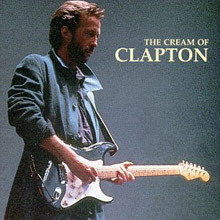 he Cream of Clapton is an Eric Clapton compilation album released in the US in 1995. In addition to profiling Clapton's solo work, the album also includes Clapton's involvement in the bands Cream, Blind Faith, and Derek and the Dominos. The sole track penned by Clapton on Blind Faith's studio album is the only one included here. YOU CAN NOW BUY THESE CREAM VINYL ALBUMS DIRECT FROM uDISCOVER!